Hi everyone! I am here today with my official last post for The Memory Nest. My 6 month term is up. It was a very difficult decision, one that I went back and forth on for a long time. Because of her and her awesome challenges and blog I have scrapbooked more these past 6 months than I have in the last 3 years. I forgot how much I loved it. Leslie the owner is AMAZING. I love her to pieces. I will still be entering challenges and doing whatever I can to help her out. One of the reasons I love scrapbooking so much is because it pushes me. It forces me to take a really hard look at what I want to tell my children. It's all about the story to me. It took me well over a week to do this layout...the picture made me so sad. It transported me back to a place I didn't really want to relive. After leaving it for a few days I realized it don't have to tell THAT story...I chose to focus on how far he has come. 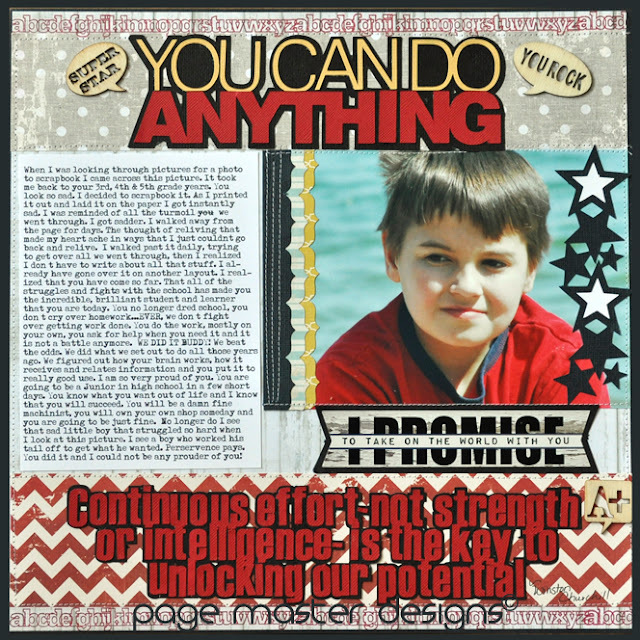 It's all in the journaling and this page is all about the journaling. I used the title and a quote to tie it all together. The alphabet border stamp is from Hero Arts/Studio Calico, the title, stars & quote were cut from my Silhouette. The sticker ( I promise) is from Glitz as is all the patterned paper. Wood embellishments are from Recollections at Michaels. Have a great day. Please stop by The Memory Nest to see what the other girls have created. What a great post. Love the convo with your son! And thank you so much for all the kind words you shared about The Memory Nest and the DT. I have enjoyed working with you too Michelle and I look forward to seeing what layouts you create and link up! Hope to work with you again in the future!